The Parker Duofold is “unecessarily good.” Parker was so certain of their Duofolds that they advertised, “Not one can fail, or we’ll make it good free!” The nibs were advertised as “ultra-smooth, which relieves writing pressure,” and it “won’t hard start.” In addition, the barrels were improved, no longer made of rubber, but now non-breakable “Permanite.” Combined with an oversize ink capacity and beautiful colors, it is a tempting pen. 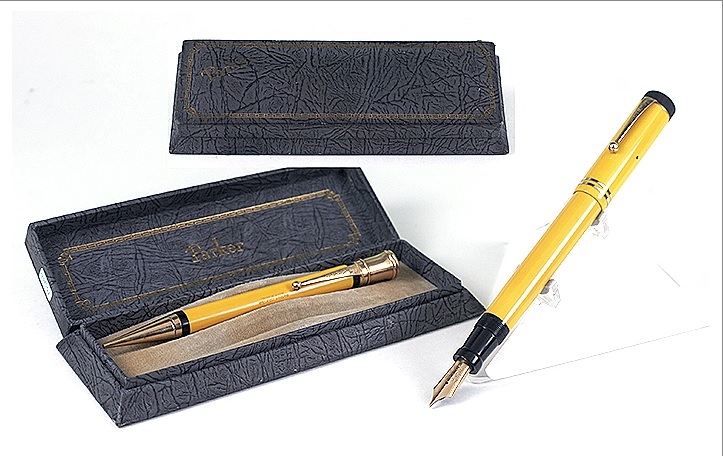 Check out our Catalog #73 – we had a 1927 Parker Duofold Sr. button-filler in mint condition. This one is sold, but you can always subscribe to future catalogs for first pick! This entry was posted in Vintage Pens and tagged Duofold, Fountain Pens, Go Pens, GoPens, Parker, Vintage Fountain Pen, Vintage Fountain Pens, Vintage Pen, Vintage Pens. Bookmark the permalink. Follow any comments here with the RSS feed for this post. Post a comment or leave a trackback: Trackback URL.